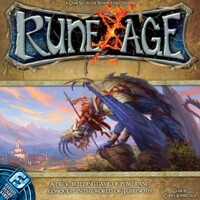 Fantasy Flight Games is proud to unveil its first exciting entry into the burgeoning deck-building card game genre: Rune Age, a game of adventure and conquest for 2-4 players. Set in the vibrant fantasy realm of Terrinoth (popularized by Runebound, Descent: Journeys in the Dark, Runewars, and DungeonQuest), players take control of one of four warring factions, setting out to build up their armies, take control of cities, and obliterate their foes. Rune Age is an asymmetrical, scenario based, deck building game where the victory conditions change from last man standing to cooperating for a shared victory. Each game players will select a scenario, each scenario having an unique victory condition, an unique event deck, and a set of neutral cards. Each player will also select a faction to play as; each faction’s unit cards are unique, and only that faction may draft those cards. Players spend their turns performing actions. Players can spend their gold to draft their private units, or spend influence to draft neutral cards, gold cards, and to keep cards in their hand for the next turn. Players can also play their cards for the actions printed on them, or they can engage in a combat action, spending strength, either against a neutral city (which awards influence per turn), another opponent or against a comment enemy drawn from the event deck. When a player is done with his actions he must discard any remaining cards in his hand, unless he spent influence to keep them. Once the last player ends his turn an event from the event deck occurs. Play continues until the victory conditions on the objective card are met. The asymmetry of Rune Age, while balanced, does force players to form their strategy based on the faction they are playing. By employing 3 resources (gold, influence, and strength) the game forces players to weigh and judge how they want to play the scenario. Gold is needed to draft more units, and units are needed for combat or influence, while influence is needed to manage your hand and purchase the neutral cards. Tension is further added by the effect of the events in the event deck, each one commanding attention from the players. The four scenarios are radically different in their objective and event decks, which give players an immediate breadth of choice with regards to the type of game they will play in any given session. The main difference between scenarios is the level of player interaction, from virtually none, to an all out war of elimination. Each scenario does dictate which neutral cards are available, which can make repeat plays of the same scenario seem rather static. Nonetheless, the game feels dynamic and worth replaying as the combination of scenarios and factions add dimension to the game; however, this can work against the game in that some players may refuse to play a certain faction and/or scenario. With the amount of deck builders on the market how do you decide which to buy? Do you go with the flawless gameplay, numerous expansions but rather dry theme, or do you go with a more thematic combat driven fantasy deck builder? My advice, try the later path, you won’t be disappointed. Rune Age has rules for 4 different ways to play, 100% Cooperative, 100% player vs player, a mix of both and 0 combat. Unlike other deckbuilders, there are two different types of currency in Rune Age. Gold and Influence. Gold is used to buy new cards from your faction to add to your deck and influence is used to buy neutral cards. Influence can also be used to keep cards in your hand instead of discarding them at the end of your turn, the cost is 1 influence per card kept. Rune Age also gives players 2 card pools to build their deck from, a personal one and a card pool neutral to all players. Every player is given a Home Realm card based on their faction, this card is used to keep track of the damage done to you. You start with 20 hit points and if you reach zero you lose. These are examples of units that are available from a faction deck. Their cost is located in the bottom right, and their combat value in the top left. These units are different for every faction, however they are not all useful in every scenario which means your card selection is fairly limited. Gold works like other deck builders, it is shuffled into your deck and drawn randomly. You buy gold with Influence and there are three different values available. Influence works similar to land in Magic the Gathering. You gain influence from cities and instead of discarding a city card after it is used for its influence, it is kept in front of you and turned sideways until the beginning of your next turn. The number inside a circle and surrounded by crystals tells you how much influence each city generates. These cities are found within your faction deck, and although their names are changed, their value and cost is the exact same for all faction. You can either buy one of your faction cities for 4 gold or take it over with a military strength of at least 2. Every game there will be neutral cities in addition to your faction’s cities, in order to gain control of a city you must play cards from your hand with an equal or greater strength than the city. The trick to cities is that you can take them off other players, in order to do this you must tie or beat the city’s strength value PLUS any combat cards the defending player chooses to play. Note that some cities also increase your defense value (the number under the influence value) if you are attacked, this is especially important in the Cooperative and Pure Player Combat versions. These vary depending on the scenario and are range from units to combat enhancements to additional card draw. Neutral cards are purchased with Influence Points but otherwise function the exact same as cards purchased from your faction deck. The symbols in the bottom left match with specific game scenarios and are used for initial setup. The event deck: This mechanic is not unique to other games but is still nicely executed in Rune Age. There is an event deck and after all players have gone there is an event turn. Some of these cards affect all players while others effect only the leader. The backs of the event deck match specific scenarios, and the coloured circles below the seal show what stage of the event deck the card falls into. The stages are shuffled and stacked so that 1 is on top of 2 etc. Although Rune Age is a deckbuilder that doesn’t mean it can’t have outstanding components. I like all the artwork, the coloured seals on the backs of the event decks are a nice way to quickly organize and break out for each specific scenario. The tokens in Rune Age are fairly generic, but did not tear when I punched them out and they are not overly small. The game comes with 1 custom die that is nothing special and hardly worth mentioning. Who would enjoy playing Rune Age? Casual Gamers: Because you can easily tailor Rune Age to your specific tastes, it’s essentially 4 games in 1, it has awesome replay value. Pretty much no matter what you’re looking for in a deckbuilder, Rune Age can do it. Deckbuilders are already friendly to casual players, Rune Age is very accessible because of the different ways you can play it and that is the most important part of a ‘casual game’ to me, how often/easily does it make it onto the table. However because of the limited card selection, and limited expansion selection there are nowhere near the amount of combinations that you can find in other deckbuilders, lots of cards work great together, but this still might be a put off for anyone more serious than a casual gamer. The other reviews here give Rune Age a great deal of well-earned credit. Rune Age is a deck building game, wherein each player chooses one of four factions with their own set of exclusive cards to pull from when growing your deck. This gives the game a unique twist on other deck building games where all players pull from the same communal set of cards, making each deck look very similar. The four factions are, essentially: generic humans, elves, undead, and barbarians. Each faction has a 1, 2, 3 and 5 cost unit, each with progressively higher strength and more powerful abilities. At least one of these units is intended to use its ability against enemy players, while the others are just as effective against both player and non-player opponents. All players also have a set of three identical stronghold cards they can purchase through the course of a game. There will also be a set of three neutral cards and some neutral cities for all of the players to buy from. Cards cost one of three resources: gold, influence, or combat. There tends to be a circular scheme in which these resources are acquired… Gold is used to buy units, units then provide combat to conquer cities, and cities provide influence to get more gold. There are a few exceptions, but that general rule proves true for most of the cards. The last thing to note are the objectives to win the game. There are numerous different victory conditions to pick, from being the first to kill a dragon, to being the last man standing. Each objective card dictates which neutral cards are available for use in a given game, and comes with a deck of event cards that flip each turn and hinder the players’ attempts at winning. Rune Age really is a fun game. The factions are suitably different from one another, all of the art is fantastic, the price tag is fair, and the different objectives ask for different tactics. I’ve really enjoyed this game and am always excited to play it again. One serious downfall it has is the small pool of cards to pick from when building your deck. Each faction has only four units to pick from, and players will quickly understand which combination of those units is best, and future games will begin to look the same. That being said I very much recommend Rune Age and am eagerly awaiting expansions. Components: Being as big a fan of good components as I am, I have to say that Fantasy Flight has never let me down and Rune Age is no exception. Their cards have a nice, sturdy feel to them with a fantastic satin finish. The Runebound universe has always been populated with fantasic art pieces and Rune Age is no exception. Every piece of artwork jumps off the cards and the overall layout of each card is very clear and crisp. Of couse, since this is a FFG release, it comes with a nice set of heavy card stock damage tokens and a proprietary “attrition” die. Rules: As with all other games in the genre, Rune Age’s primary mechanic revolved around drafting cards using in-game resources in order to create an effective deck. Where this game deviates is in it’s use of faction specific “barracks” (pools of cards for each of the game’s 4 factions) as well as neutral cards (which can be purchased and used by players of any faction). In addition, the game ships with a number of scenarios which will effect how players interact with one another as well as the game itself. Scenarios determine which cards make up the event deck and this in turn provides challenges beyond the other players in the game. Gameplay: For all it adds/changes/tweaks to what may be considered the “classic” deckbuilding format, Rune Age is very easy to pick up and play. Each faction has it’s own quirks and playstyles which shift between the different scenarios and the event deck adds a nice layer of neutrality during some of the more cutthroat and competitive scenarios. It may take players a few turns, or perhaps even a few games to fully grasp all of their options and understand how both faction and neutral cards can be combined to produce the most advantageous effects, but from my experience, each and every turn spent learning the game is just plain fun. Overall: Rune Age is a wonderful addition to the burgeoning deckbuilding market and a worthy carrier of the Runebound mantle. FFG did a very good job of creating a game that will be familiar to fans of the genre and fans of the IP without forcing the marriage between the two. Every time this hits the table, I am excited to play it and I sincerely hope that FFG will continue to support the game with future expansions including more units for each faction, more neutral cards and (most of all) more scenarios. Rune Age is rapidly becoming one of my favorite games. The four different scenarios in the base game have something for every gamer in my game group. “The Cataclism” features full coop play for gamers looking to work together. Players win together if they make it through the entire event deck. They lose if a single player’s home realm is destroyed. (Though look out for the “Brother Against Brother” event card. Someone could get greedy and win it all themselves! “Runewars” is quite the opposite. This scenario is popular amongst the wargamers in our group. Featuring player elimination and facilitating and promoting direct conflict. Games go relatively quickly though, so they shouldn’t be siting out for long. “Resurgence of the Dragonlords” is a little in between. Players have an uneasy partnership as they have to work together to defeat the enemies in the event deck. The whole time they are strengthening their deck to become strong enough to defeat the scenario card itself. This is the way to win this one. Good middleground. Lastly is “The Monument.” this reminds me of the race for advancement in RTS computer games. Direct conflict isn’t allowed, so it’s a good choice for your pacifist friends who enjoy more of a solitaire or euro experience. Just get as much of a money producing deck as you can and build your monument. These scenarios are what make this game stand out from the other deckbuilders (of which I own most.) Great fun, and I look forward to future expansions! Learning the game is so easy, I can see that mastering it would take at least a few play throughs. Just to show how easy it was to learn, I did a 2 hour event learning how to play it. The next day, I was running to separate groups through playing the game. There are 2 resources used for buying cards. One is influence, which mostly stays in play, like Magic the gathering lands. One is gold, which is cycled through your deck. I like this mechanic, as your hand does not get overloaded with non-combat cards. There are 4 factions that are playable in the game. The Elves are probably the hardest to figure out. Once I figured out some strategies with them, I found them to be extremely powerful. The Chaos faction can be powerful, but is a bit temperamental and unpredictable (makes sense right!). The Human faction has some fun mechanics for throwing out a ton of guys in battles. Also, the staple to this game is the Footman unit. Which I found that every single separate group that played the game made jokes involving the Footman. It was actually quite funny how it happened with every group. The final group is an undead faction, which is the only one I did not have the chance to play. But getting creatures back from your discard into play and digging up a bunch of extra guys from your deck is fun times. 2-4 players is what this entry suggests. If you want some solo play when nobody else is available, or you want to practice some strategies, you can definitely give it a shot in several of the scenarios. 12+ age is probably a pretty accurate assessment of the maturity level needed to play the game. 45+ minutes is probably going to be the average game length, and the first couple of games will be 30+ minutes in excess to this. If you have all experienced players that are good at deckbuilding games, this game could take less than 30 minutes. I love this game, and that is not understatement. I could have played it all through GenCon, and that might have gotten tiring, I emphasize the “might”. the was one of the games I didn’t plan to buy at Gen Con, but it was too much fun. I’ve played Rune Wars once and liked it, but this plays under 45min with 3 players and under a hour with 4 players and has a great feel. I’ve played every race and I look forward to trying it solo. I’ve liked exploring all the differences and strategies for each race. Keep that discard pile big for the Undead, the human want a thin deck with all their big guys in it. Good stuff here. It doesn’t feel like a deck building game to me. It’s an army manipulation building game to me, based on the scenarios. And that’s where it shines. FFG really can support this or fan-created scenarios can breath continued fresh life into this game. And the tug of war for the cities. Plus to two diirent resources, gold and influence is great. Fantastic artwork, great game mechanics, quick playtime, different army strategies, and multiple scenarios. FFG has a real winner here. This may sound weird, but it kinda feels/reminds me like an old TSR ccg, Spellfire, which we loved, but that game was unbalanced, this one is far from that, plus it’s all in a nice small travel size box, even if it’s all sleeved. I’ll go into the other aspects of the game in a moment or two but I wanted to start here as it’s what has really picked this game out from the crowd for me. I game in two distinct groups – my main gaming group (4 guys in their 30s and 40s) and amongst my family (age range more varied but starting at 7). As a consequence I tend to find the most value in games that can work for both. Rune age offers a range of four scenarios in the base set. One is collaboritve, two are PvP (player vs player) and one can be played either way. The scenarios give the gameplay a distinct flavour for any given run through the game that supplements the atmospheric races that the players select on any given run. The fact that the scenarios offer such a range of game-play really helps fit the game to the distinct gaming groups I play with. My family group tend to prefer thimgs towards the collaboritive end of the scale whilst my main gaming group are much keener on the challenges offered by PvP play. The scenarios also help with replay value, offering a lot more distinct flavour. On any given run through, each player selects from four available races (basically Humans, Elves, Undead and a Demonic-style race). Each race has its own deck of troops and their special abilities really offer a distinct flavour that makes the game a different experience for each different mix of races. The races also have a really distinct flavour that, for a roleplayer or fan of fantasy literature, resonate really nicely. Elves are a slow-build race, humans are fast and are generally able to throw hordes of lower-powered units into any given battle. Undead pluck troops out of the discar pile to throw into play and can feel like an unstopable force early on. The ‘demons’ can injure themselves to bring about special effects of various sorts. The component list is pretty simple – a special ‘attrition dice’ used to destroy troops that attack certain scenario cards, a load of cardboard counters used to track various scenario victory conditions and then a lot of cards. The cards are split into the race decks and few different types of ‘neutral’ card such as gold, scenario cards and so on. The components are all of excellent quality and whilst our cards are starting to show some wear now, I feel it’s from legitimate regular use rather than any defficiency. The counters still look pristine and the dice has a nice weight to it with clearly-defined symbols that are easy to pick out and have yet to wear at all. It’s hard to really criticise this game for anything at all in the base set. The only things that I found are when it is combined with the expansion. In particular, the box design holds all of the cards in the base set and about 2/3 of the ones in the expansion. We redesigned the box, with some new carboard interior boxes to hold the new cards which solved the problem. Secondly, one of the scenarios in the expansion isn’t very well balanced and we’ve had to house-rule it to balance it up somewhat. These, though, are really minor minor things and unless you think they’re going to drive you mad they shouldn’t put you off from what is a great game. There are four modes of play included in the game which make each game experience different from the last. An all out destroy your opponents death match, a race to build a monument, a race to develop a large enough army to take out the Dragon Lord, and a co-operative survival mode that tests the whole group’s ability to build a deck. Each of the four races needs to work a little differently in each mode of play, and even within each mode there are different ways to play each race. A great little game, one of the easier deck-builders to set up and teach, with more a more focused theme. A little gem for sure! I love most of the games in the Runebound universe, but I don’t always have 3+ hours to play them. I also love most of the deck building games that I have played. This is a wonderful bridge between these two elements. It is easy to teach, and my buddies and I have had a lot of fun playing it. There are several mechanics that separate it from other deck building games, including the different scenarios and the ability to store cards in your hand instead of discarding them. The scenarios let you play a different style of game depending on what kind of game you feel like. You can play an all out death match, a heavy gold accumulating scenario, or others. This makes the replay value much higher, which is one of the most important factors in a game for me. It only takes roughly an hour or so too, but that Runebound feeling is still present. All in all, a great edition to any gamer’s library! The rules are a bit of a fiasco to deal with. Took some extra playtime to figure out the mechanic. If you’re used to Dominion, the rules will confuse you. The cards are beautifully done and a nice high quality. The quests that DO come with the game incredibly challenging and fun to work on. I am looking forward to some new stuff for the game, but I’m not that kind of guy that whines about the game he just bought hoping for more. This game is packed full of fun stuff. If you like deck builders, get it. The game is worth it. To add to all the excellent reviews thus far I would say that the standout of this game vs other deck building games is that the anticipation of getting a great roll or pulling out a last minute win puts it a notch above the static card deck builders. Even when your behind or if one of the folks your playing with has a strong creature position I felt we collectively still had a chance to pull the rug out of under the leader and win. Keeps it more exciting to me vs the more mechanical “build an engine” of Dominion and Thunderstone, both of which I enjoy. Rune Age combines fluid easy game play with a unique fantasy combat twist. Unlike thunderstone the end game of the game doesn’t include 5-6 turns of combat where you are almost guaranteed to win. The game has a great build up and no matter which victory condition you play by you end on a climax of the game. The numerous game play variations make it appealing to many different gamers, co-operative, a race to kill the biggest monster or build your monument first or a competitive cut throat version that pits players against each other. Defiantly would recommend buying this one! The game has a good amount of unique depth to each of the four sides, that is appended to by a random draw/order of locations per game, as well as a small (not always the same) set of ‘everyone can buy these’ type cards. With some of these parameters changing based on the game type (there are a few provided with the game) that is being played. The issue comes in the fact that the random/displaced features make up a very small percentage of the game and that the majority of the game revolves around knowing howto control each of the four decks effectively. The (sad) reality to this game is that once a player (or set of players) are at that point the game ends up staling quick with the playgroup as there is not enough to get the thought process flowing. I play this at home with my husband and son and love playing the co-operative challenges. Whilst there is a luck element to this game more of it is about skill and strategy. The cards are lovely and well designed. It is a game that can be played many times without becoming monotonous. Each of the races has a very definite character to it and they all seem to be fun to play. I usually play humans and help out in defense, leaving my husband and son to build up armies so that they can defeat the big bad guy. This deck building game will change everything you know about deck building games. It will challenge you to make different decisions based on the scenario you choose to play. With several unqiue ways to play this game, it has high replay value. We couln’t put this one down at Gen Con. The four factions/decks are balanced and allow for players to mix it up or pick what best suits their play style. Only negitive I saw was the understanding of some of the play phases, but with some extra attention to the rule book you can find all the answers. Fantasy Flight has added just the right amount of exotic spices to the deck building genre to make this offering stand apart. The three types of resources, coupled with the variety of scenarios adds some zest to the expected gameplay. Gamers even remotely into the Terrinoth fantasy world will delight at the interplay between the different races. Good luck with the Cataclysm, though! Yes, building your deck is core to Rune Age, but there is so much more to playing the game than just building your deck. You need to balance when to attack your enemies, or attack the scenario in order to win. Add a Review for "Rune Age"